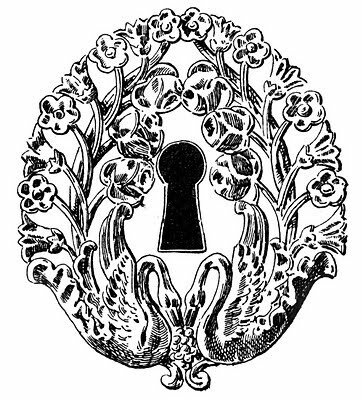 Grain de musc: Unlocking an Unknown: Would a Rose without a Name Still Be a Rose? Unlocking an Unknown: Would a Rose without a Name Still Be a Rose? The late Mrs. Webber was a lucky woman, at least by the standards of the people who’ll read these lines. Her husband was a perfumer/chemist for the Stepan Company, apparently a leader in the American aromatic chemicals industry, and though his main claim to fame was to have composed the fragrance in Pinesol, well, hell, more people in the US have smelled that than will ever get a whiff of N°5. Having a husband who composed perfumes meant Mrs Webber had access to quite a number of them, many unreleased, hence the sizeable collection she left when she passed on. And that’s where she got lucky again, since that collection, rather than ending up dumped wherever it is unsold estate sale items go, was nabbed by a self-confessed fragrance fanatic, Carol Sasich, author of the blog WaftbyCarol. Carol initiated this joint-blogging operation around a scent that Mr. Webber clearly worked on: there were 22 unlabelled bottles of it in the Webber collection, six of which she forwarded to fellow bloggers for reviewing. The scent she named Mystery 6T is quite likely from the mid-to-late Seventies or perhaps the Eighties, since it seems to have damascones in it (they were first used in 1979 in Nahema). It is not un-reminiscent of Guerlain Parure: a rose with strawberry and raspberry facets as well as a touch of peach, and that sprinkling of cinnamon many roses give off, made airier by hedione on a chypre-type base. It is a lovely composition, very competently put-together and a little unexciting, with none of that Empire-State-scale grandeur you find in the best American perfumery of the time (which basically means Estée Lauder). It may have been meant for some mass-market company like Avon or Max Factor, at a time where mass-market still offered well-made, if often derivative, fragrances to their customers. Or is the lack of excitement due to the fact that Mystery 6T will forever remain bereft of what draws us to a fragrance, apart from its actual smell? A name. A flacon. A story. All that lifts scent out of a bottle and into our minds. After all, if wine experts rate a Grand Cru Classé lower when it's presented as a table wine, why shouldn't perfumistas be more powerfully moved by a juice with a legendary name than by a humble nameless scent? Mystery 6T has no story, apart from that of its finding and last journey across the globe. It was never loved enough to make it to the shelves. Possibly, Mrs. Webber didn’t love it that much either since those 22 cut-glass vials remained untouched. She may have kept them in honor of her husband’s memory, or simply never bothered to dispose of them. And there they sat, melancholy reminders of long years of well-travelled married life, until Carol saved them from oblivion. 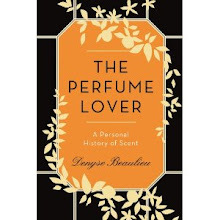 In fact, studying the list of the bottles Carol bought, I wonder what the late Mrs. Webber loved about perfume, what her tastes were: the collection doesn’t reveal that, really. There are several classics: N°5 and Calèche (neither of which Carol got: they were the only two that appealed to less knowledgeable buyers). Jicky and Shalimar. Joy and L’Air du Temps. Équipage, Ô de Lancôme and Opium. All best-sellers and wildly varied in style: the type of thing a husband gives his wife on her birthday or brings back from a business trip. The rest is mainstream American: Avon, Tuvache and Max Factor; Coty, Houbigant and Dana at a time when they were already sold in drugstores. Plus a couple of things that were clearly picked up on holidays. And, of course, what her husband brought home from work, most of which never seems to have been touched. The ultimately happy fate of the Webber collection does make me wonder at what will happen to mine. If I never bought another drop – a most unlikely event – I’d probably still have enough left over to be embalmed in even if I lived to the age most women in my family reach. I’ve never given much thought to the fate of those bottles. Post a comment on any of the participating blogs as to why you should have a bottle of this rare, unreleased parfum and we will choose the most creative reply as the winner of a 15 ml, full bottle of Mr Webber's parfum 6T, one of the 22 bottles in existence ! Was she, like many women of her generation, inclined to dab on a touch only on special occasions? This reminded me of my mom. She had many bottles of perfumes and colognes but only wore them for special occasions. And since she wasn't inclined to go out much there they sat almost full. Denyse, what an intriguing post! I loved how you peered not only into the heart of what was in the mystery bottle, but the collection as a whole, and how it reveals some perhaps telling things about the heart of the couple. I've been reading Carol's posts but never paused to think about the fact that almost all of the bottles in the collecton, whether the well-known or the ones Mr. Webber created, went untouched! So glad they are now on the receiving end of Carol's loving attentions. Amy, you and me both. I have two uncles who worked as chemists at Stepan, so I'll be calling them tonight to ask them what Mr. Webber worked on, and what they know about the Webbers in general. I'll report back later on what I find out. I've always wondered if it would be possible to find a common thread among the scents I own, but I'm not sure that's possible. Oh Karen that's fantastic !! Karen, seconding what Carol said. This is unfolding like a real mystery story! Carol, see what you've started? Fascinating. Your review directly touched on the very thing that I find so haunting about the Webber Collection: the question of who loved it. Mr. more than Mrs., perhaps-- he clearly "took his work home with him", and she may not have shared his zeal. As for his collection, the thought of it abandoned to the fates is also haunting. I think of Martial's proverb: "Never think of leaving perfumes or wine to your heir. Administer these yourself, and let him have your money." I've talked to both my uncles, but I'm afraid I wasn't able to find out much. It appears Mr. Webber worked for General Aromatic Products, a company which was bought by Stepan, and then later sold. Neither of my uncles knew Mr. Webber personally, so I wasn't able to get any more info on either Mr. or Mrs. Webber. I did ask about one of the bottles in the collection, which was labeled Stepan. I asked whether or not the company produced in-house scents, perhaps to be given away as Christmas gifts to employees. One uncle said this was a possibility, as he remembered receiving similar gifts, such as scented soaps. The other uncle, who was higher up in the company, remembered colognes being produced like this, but very rarely. He remembered on at least one occasion a scent being produced as a door prize for a party, but he didn't take it home himself. Sorry I couldn't be of more help! Guess I've got a lot of administering to do, then! Karen, thanks for the sleuthing! Although a bottle marked "Stepan" could also mean, apart from any in-house product, that this was a trial made up for a perfume house. Nowadays they're just in little glass atomizers, they may have been presented differently back then. Somehow, a perfume without name is like a perfume which still is in limbo. I often think about all that unborn perfumes which have been formulated by noses but that finally never get a name, but they are still perfumes waiting for someone to know them. I'd love to have the chance to try one of those beauties, like this Mystery Sixty. Isa, limbo is the right term... Yes, there are so many scents that never found a taker, the mind boggles to think of them. Perhaps, as you say, they're in limbo, which is where I was taught unbaptized babies went... In the case of others, I suppose some of their DNA got into perfumes we know. along with my handbag 'room' I am having El O build a perfume 'room', complete with a little fridge for the really fabulous ones. This could be very happy in there. Btw, El O hates my guts :-) Might as well give him an even bigger reason, eh? ps. the fact that Carol was able to acquire these is a gift to perfumistas everywhere! Imagine had they ended up on the trash heap. Tragic! I think it must be difficult for modern perfumers to satisfy us perfumistas because it's these kinds of scented love stories from the past that grab us... this "Somewhere Over the Rainbow" longing back to what we see now as a simpler time. 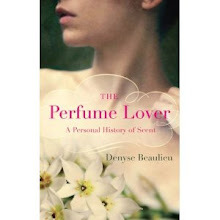 You see, Denyse... even a story-less, uneventful, no-name perfume has grabbed all of our imaginations. Sometimes I think the story is superfluous and other times, I think the scent is superfluous... it's all about the story. Many thanks to all for commenting , and Karen you are a gem for following up on Webber !! Loved that you imagine more to the "story" of Mr & Mrs Webber, Denyse. Karen M. was terrific to do some more research as well. I've been enjoying the mystery of Carol's auction finds. G., as I said, it could really be the start of a novel, couldn't it? How interesting. I find this idea of husband giving wife perfume as ritual gift quite compelling. It seems like a nice grace note. How to implement this at my house! I'm fascinated by the oldies. They seem to play with different chords...where ozoney, fruity, cotton candy, shampooey weren't in the lexicon....I'm envious!!! Cheryl, of course it's just a hypothesis of mine: perhaps Mrs W. did her perfume shopping alone. But it was the done thing for a husband to bring back a gift from a business trip abroad back in the days... The line-up struck me as pretty eclectic though.